Mary, It said NO COMMENTS so I thought it meant no one could comment.... Jeez Louise... LOL but I clicked on it and figured out NO COMMENTS had yet been made. ----- I am Guy's friend from California.... though we are now living in Albuquerque, New Mexico.... It is like Buffalo but with real buffalos.... LOL ++++ Just to add.... 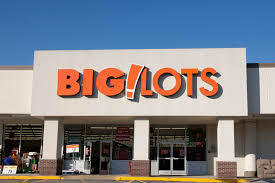 I LOVE BIG LOTS!..... I began shopping there in CA back in about 1971... when it went by the name Pic 'N' Save.... great store.... good items at good prices... and weird stuff which couldn't get distributed anywhere else.... bought notebook paper, art supplies, knick knacks, ash trays, plastic ware, clothes.... lots and LOTS.... Big Lots... of clothes... in the 70's.... for while you couldn't find anything but polyester or other synthetics so foreign outlets, i.e. China, Japan, Iran, etc. would have great deals on shirts and pants in 100% cotton.... the only thing close to Pic N Save back then was "The Akron".... started in 1948.... but in the 60's and 70's was much like Pier One only cheaper... I mean, less expensive.... those were the days.